Margaretville Hospital offers comprehensive physical therapy services during their hospitalization, as well as outpatient therapy services. Our expert rehab therapy team is comprised of highly qualified licensed Physical Therapists, Occupational Therapists and Assistants trained to evaluate and treat conditions in order to maximize functional independence. Our PT/OT team works collaboratively with a range of health care professionals, including nurses, physicians, and occupational therapists, to create an individualized plan of care and assess discharge needs and options for our patients. Inpatient Physical Therapy: Our team takes a multidisciplinary approach to create an individualized plan of care so patients can be safely discharged. Patients will work to restore flexibility, strength and mobility. For patients who have stabilized after surgery and need intense physical rehabilitation, we offer a Swing Bed program, which aims to quickly return patients to the same level of independence that they had before their admission. Some patients also have the option to spend a few weeks in a nursing home with assistance from staff to get stronger. 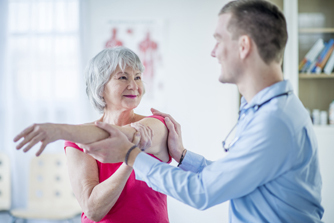 Outpatient Physical Therapy: Offered for patients in pain, either chronic or after injury or surgery, or who require rehabilitative services following discharge from their inpatient hospital. Our fully equipped gym has all of the equipment and modalities needed by our physical therapists to help you reach your goals. Inpatient Occupational Therapy: In addition to general physical therapy activity, occupational therapy focuses on everyday activities, like getting dressed, eating and performing household chores. Independent Exercise Program: Discharged PT/OT patients are eligible for a $20 monthly membership to work out at our gym. With their physician’s clearance, our former patients can work out under general supervision of our physical and occupational therapists, who help set fitness goals and provide an exercise log. Inpatient Speech Therapy: Our state-licensed speech-language pathologist provides speech, language, cognitive and swallowing therapy for long-term and swing bed patients at Margaretville Hospital. Stroke patients can suffer neurological effects that affect speech and language skills, while patients who have undergone intubation need to strengthen their swallowing ability before returning to a normal diet.